Understanding Custom Thermal Solutions Better | Noren Thermal, Inc. The rate at which electrical and other thermal management technologies have advanced over the decades has been a significant benefit to companies in most industries. In some cases, company leaders may not fully understand the innovative techniques that heat exchangers utilize to prevent overheating, yet they easily recognize the advantages that they provide their overall operations. In other cases, it’s because of that lack of understanding that companies fail to make the investment necessary to streamline their thermal management processes. Today, we examine a few ways in which heat exchangers benefit the companies that rely on them, and why increasingly more organizations are relying on them and similar custom thermal solutions. What does transferring heat mean? Heat exchangers made an impact on thermal management due to their ability to simplify the process. 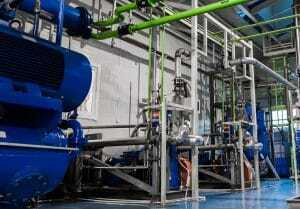 For example, they operate on principles of transferring waste heat instead of HVAC processes. Rather than combatting the heat with the help of chilled air, heat exchangers contain cooling fluid that absorbs and transfers waste heat as soon as it’s produced. Once it becomes heated, the fluid easily travels to a cooler area of the heat exchanger to release the heat that it has collected. How are heat exchangers more efficient? Transferring heat is a much simpler process than fighting it, but it’s also a much more efficient process. Traditional thermal solutions, such as air conditioners, can be costly to operate, especially for companies that utilize large-scale equipment (such as manufacturing technologies). This is due mainly to the complicated nature of the machinery and the many moving parts that can break down or become worn down. It’s due to the amounts of energy that air conditioners require, which is often many times more than the energy required to operate heat exchangers. By eliminating traditional HVAC equipment, companies have been able to take significant steps in making their operations more eco-friendly. In addition to using significantly less energy, heat exchangers also don’t utilize harmful chemicals, such as Freon, to facilitate the cooling process. This means they don’t produce or release any potentially harmful chemicals into the environment, and they help companies lower their environmental footprints by reducing their overall reliance on energy. For more information, or to gain a better understanding of customer thermal management, call Noren Thermal Solutions in Taylor, TX, at 866-936-6736.